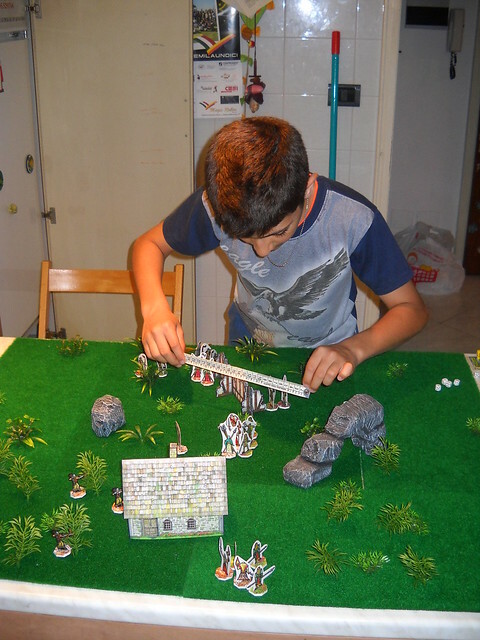 Now complete rules, 2 factions (with minis and stat cards), counters, templates. I’d love to get a few people that are in to tabletop gaming to give this game a try and offer up some feedback. Love the minis! I would love to participate in the play testing. I can also contribute cutter files (craft robo). I already have a set of the Woodwold Boskers cut out as well as double sided cards. I have experience with Clix, Star Wars Mins, and Flying Lead. So I have four play testers through Cardboard Warriors and one other player locally... That seems like enough to me so I'll call my request for play testers closed. Unless you would prefer to correspond via e-mail we can use this thread for feedback. I also am in the process of getting a forum ready to serve Into the Fray if it is ever released, if we want to spread out more we could move the discussion there. I know it will take a while to get everything put together and get some games in...but whenever you have feedback I'd love to hear it. OK! Let me tell you about the kind of guy SAMMO is. ...paid to ship this all to me. I had a very difficult day, and received asome more bad news. This couldn't have come at a better time! I hate that you are going through so much right now, but it's great to see Sammo doing MORE than the right thing. Well, it takes a special kind of person to "bring something like this to the table." Fortunatley, this site is FULL of them. Just received my playtest packet today and it was packed to the gills with edging pens, everything printed out, and card protectors! Glad to see the US postal system didn't let me down! Like any community, gamers should help out other gamers how and when they can. So while I think there is little that I could really do to help kiladecus out with his troubles, I hope that being able to have the recreation of making paper minis and playing some games will at least help keep his spirits up. For the rest of the testers...Ink is clearly the most precious commodity for all of us paper modelers, so I hope the printed copies can offset that cost at least. The card sleeves and pens are so that you can put the cards in the sleeves (obviously) then use the erasable pens to track wounds (or the use if dice from dice pools) while you play. Then in between games just wipe off the card sleeves and you're ready to go again. I had meant to stick a note in the packages, but it must have slipped my mind. Anyway, enjoy. I'm looking forward to hearing how your games go!. I just want to say that i'm still waiting the envelope, and that is the only reason for not having tried the game yet. I will wait this week again, and then i will go printing it. No worries Parduz. Whenever you get to it will be good. Thanks for the new tokens Sammo! They look great! Especially the Camp and Can. I'll let you know how they work later next week. Holy cow, you spent a lot.... well, i'll build it the fast as i can and try it. Glad you're getting the files. Also it might be kind of a double bump, but the first bits of Into the Fray flavor text are up over at Moss Games. If you are interested you can have a look HERE. So I am working on getting things ready to have a proper release for Into the Fray. I have a lot of polishing and layout work to do (plus I am determined to get a certain amount of the setting and flavor text ready to go with the initial release). There are also new units in the works (I finished up the last of the new minis today), a total of 6 new units (including two new casters, with new spells). This will provide a total of 24 units (12 for each faction) which should offer relatively robust choices when it comes to army design. I have to admit that I was a little overwhelmed with it at first, but with Sammo's help (it is so cool to drop an email or pm to the designer instead of waiting for a release of FAQs), I was able to work through it. In the end, only one word describes this game: awesome. The characters are great, and the troop choices are give you a lot of diversity. To me it is almost like a blending of Warhammer and Magic: the Gathering. You have your figures and they can give bonuses to other figures (via spells) and since you can play any size game, there are also benefits you can purchase. Unlike certain games where the races seem to have inherent benefits and weeknesses, ITF let's you cutomize your army by purchasing certain dice. I played the same army twice, and each time purchased different dice options. It really was like playing two different armies. If you favor the heavy-handed soldiers, or the spell-slingers, ITF has just the army you are looking for. I am anxious to see the upcoming factions! Very well designed and very fun to play! Work continues... so hopefully everyone will be enjoying ITF in the next few months (I am still on track for a summer release). I'm slowly building it. Everything (even my beard and my arm hairs) has been spray glued (your paper is really prone to absorb my spray glue and make it pass to the front side, so it's a really tacky affair. Luckily, the ink does not suffers from this). Cards are cut and ready in the sleeves. Despite all of the benefits of paper minis it can be quite a chore if you are trying to get a bunch of figures ready at once. You can get the counters and templates cut out pretty fast with scissors, but it still takes a while. Hope you have fun when you get to the table to play ! Played it tonight with the kid! All faction advancing, using any available cover. Crushin' at the center of the battlefield, with ranged unit at the sides, saturatng the air with arrows. 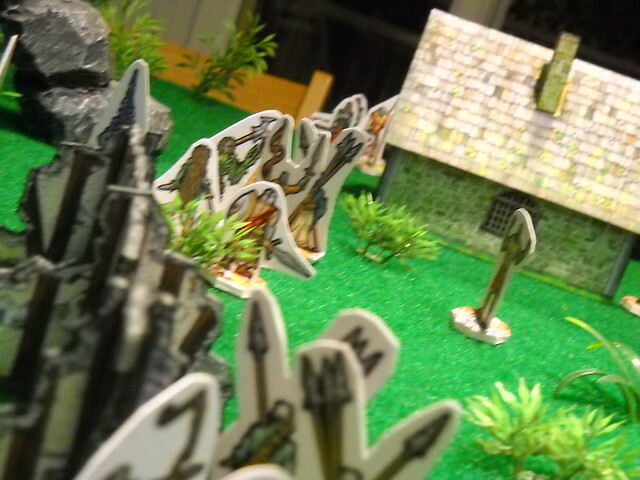 The wizard wiped out almost any troop near to the house. The son felt inspired and shoot some artistic view. My "Big Guy" still walking to reach the battle. My troops were already wiped away (you can check the bodycount on the top-right corner of the image ), while the wizard defended himself very well. But i lost, 'cause the "Big Guy" took a solid dose of damage from some lucky roll. I already know this, but now i can say it: this is a great game. There's a lot of "options" you have to grasp, but it is simple and fun. If i have to find a "glitch" in it, i'd say that the dice roll could have more "meaning"... i mean that often an attack does'nt do damage, so things become a bit static. But i may have played something wrong, or maybe it's a feature 'cause it allow you to react without die immediatly.... anyway i felt that "damage is not enough". Awesome shots, Parduz ! 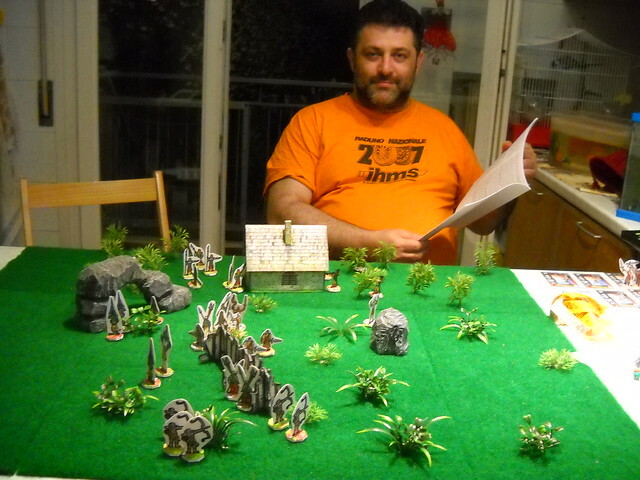 And your minis look really good in action, Sammo ! So, your avatar, Parduz, is actually a self-portrait !? Most epic 3D/photoshopping ever !!! And if I had been a Germanic warrior, I would have NOT fought against you as a Roman soldier. Parduz, I'm glad you were able to get a game in. Also looking forward to hearing about you Tuesday game. Nice pictures as well, looks like your moquette terrain is working out well and I would have never guessed that your forum image was a photoshopped you, excellent work. 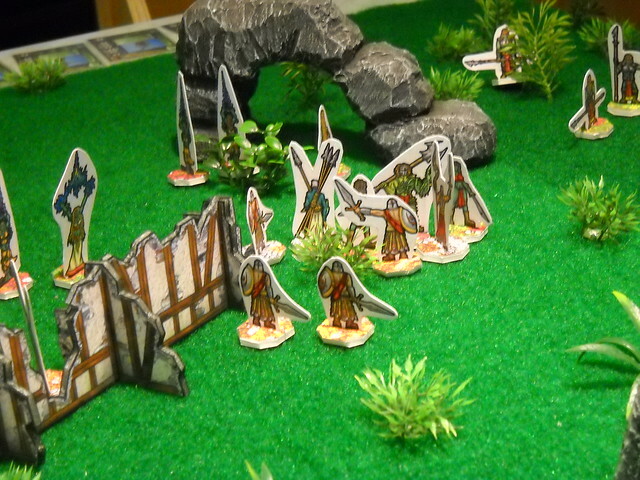 Yes... my fear was to see the paper minis "floating" over the "grass" (they are really light after all, and the plastic miniature have that "cave" base that also helps to "go deep" in the moquette).